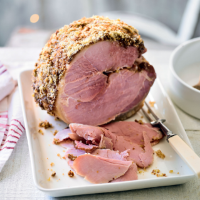 This is a sweet mustard and breadcrumb-crusted festive ham, served cold in wafer thin slices. It’s always worth cooking a large joint so there are plenty of leftovers for grazing on! 1. Put the gammon in a large saucepan and add the onions, celery, bay leaves, peppercorns and cloves. Top up with cold water to cover the meat completely. Bring very gently to a simmer, cover with a lid or foil and cook over your lowest heat for 1½ hours until the ham is completely cooked through. If the ham is not completely submerged in liquid, turn it halfway through cooking. Leave to cool in the liquid, overnight if more convenient. 2. Preheat the oven to 200°C, gas mark 6. Drain the ham, remove any string and cut away the skin. Combine the mustard and sugar, and spread all over the fat. Press a layer of breadcrumbs on top, pushing down firmly with your hands. If liked, score the fat in a diamond pattern with the tip of a sharp knife. 3. Transfer to a roasting tin and bake for about 20 minutes until the breadcrumb crust is golden. Leave to cool, then chill until ready to serve.